Ever thought you’re too old for mission? Forget the excuses. With a trip like this you’re not limited to reading about it, commissioning others, and praying, you’ll be equipped and prepared to experience mission for yourself. Father Demesi (Left), with Graeme Mitchell next to him. His parish has offered to host the Golden-Oldies Group for a special Village service and luncheon while on their tour. When preparing our Golden-Oldies Mission in Fiji recently, I met Father Demesi. He’s short man with little formal education, yet he is godly, wise and passionate about growing the faith of his village people, supporting his fellow ministers in the region and witnessing to all he comes across. Sitting on the mat in his vicarage ‘hut’ with a cup of tea, I hear about the challenges and joy he has in ministry. Regularly he gets up early to catch a bus to Suva in order to have his newsletters printed at the Church office. Some days he gets a local taxi to minister to a family in a neighbouring village; or walks for two hours to take a service in a remote bush-clad village. In preparation for our ‘Golden Oldies’ his church and village are merging their 7 services to one combined celebration, including a special village luncheon in our honour. That’s the warmth of Christian hospitality that we will experience day after day in Fiji. 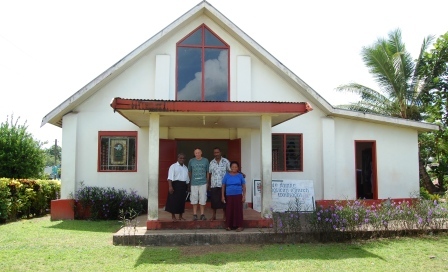 I believe you will be proud of the great work being done by the Fijian Anglican Churches. Be inspired that we can actually make a difference by visiting and encouraging them. And finally, be prepared to let God to speak to us about how we can further support them in whatever way God leads on our return to New Zealand.